Delicious Italian dishes will leave its mark in the heart of any gourmet. Cook it very simply and quickly. - Olive oil, 50 g.
- Black pepper and salt as much as you want. Cook the sauce, constantly stirring, take butter, melt in a deep frying pan, place onion, garlic slightly fried. Then add fish sauce and cream. If there is no fish sauce, you can cook without it. Fry peeled shrimp, until Golden brown on high heat in olive oil, pepper, salt. 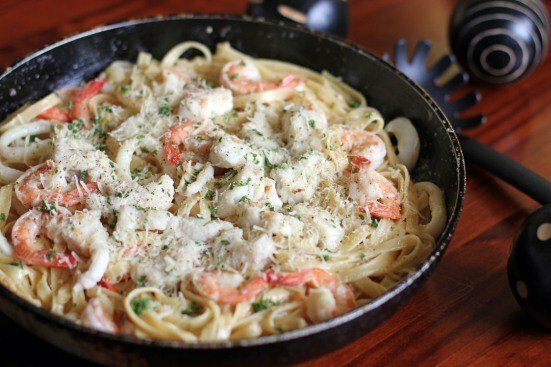 Slightly undercooked pasta to use in the shrimp, pour the prepared sauce, sprinkle with Parmesan cheese. Continue to cook 1-2 minutes, stirring constantly so that the cheese is completely melted, i.e. brought to a thick state and everything is turned off. Can bring to the table.